Toys stars Robin Williams as Leslie Zevo, son of the late inventor and toy magnate Kenneth Zevo (Donald O' Connor), who leaves his business in the hands of his brother, Lieutenant General Leland Zevo (Michael Gambon). When General Zevo begins diverting company funds into military applications of Zevo Toys' technology, Leslie must wrest control of his legacy away from his uncle, with the help of his sister Alsatia (Joan Cusack), cousin Captain Patrick Zevo (LL Cool J), and girlfriend Gwen (Robin Wright). Barry Levinson co-wrote and directed this unusual comedy, displaying a remarkable ability to modify his style to suit the material. The atmosphere at Zevo Toys is filled with colorful, whimsical details�Alsatia designs dolls in a life-size playset environment, Leslie lives in a pop-up book mansion, and even the assembly lines have considerable personality. The exterior scenes are set in a sea of rolling green hills and gently clouded blue skies, where no buildings intrude other than those created by the production designers. Visual surprises abound, and set designs are frequently Expressionistic, giving the film a unique character. Music selections are similarly innovative, with a generally Celtic tone that meshes seamlessly with alternative pop selections and a couple of effective in-movie musical numbers. Robin Williams plays Leslie Zevo as a childlike adult, one of the last of his "old school" performances, filled with obvious ad-libs and a certain amount of vintage Williams stand-up schtick, including a brief Mother-Theresa-as-Se�or-Wences bit. It's not always effective; there are times when Williams' antics threaten the film's intended atmosphere, and for every truly funny bit there's another one that squeaks by on the actor's sheer manic energy. But I have to say I prefer Leslie Zevo to the edgeless, neurotically sympathetic roles Williams has been assaying in recent years. Joan Cusack brings her wonderfully off-center sensibility to bear on the role of Alsatia, and the character's high-contrast, porcelain appearance displays Ms. Cusack at her most attractive. Michael Gambon is perfectly cast as General Zevo, a tin-pot CEO with a low self-esteem problem, and LL Cool J and Robin Wright both seem to be having a good time. Toys was not a hit during its original release, grossing in the low 20 million range domestically. Marketing is partly to blame�it was a tough sell, and the promotional effort seems bizarrely inappropriate in retrospect; I believe Toys is still the only Barry Levinson release to spawn a licensed video game cartridge. The film also has its share of problems�the satirical concepts are too dry to appeal to kids, but the climactic sequence is too juvenile to register with adults (echoing the style of Spielberg's lesser efforts). Levinson pulls off a few minor miracles, including an amazingly schmaltz-free Christmas pageant opening sequence, and a certain amount of Strangelove-esque humor that counterbalances the presence of Mr. Williams. But the film's imaginative, highly visual opening act is its best feature�once the plot kicks in, the story slowly deteriorates into a run-of-the-mill "hero versus The Establishment" plotline that works, but is far from fresh. Worth checking out for the things it does well, but it's a bit of a misfire. Image Transfer Review: Fox presents Toys in its original 1.85:1 widescreen theatrical aspect ratio, with a decent dual-layer anamorphic transfer. The film has a soft look in most scenes, and the source print exhibits a few damage and dirt flecks, but colors are rich, details are legible and the film's striking visuals are well-rendered throughout. The cinematography frequently makes use of the 1.85:1 frame's full width, and it's nice to see such a solid presentation of this 1992 release. Audio Transfer Review: Toys is presented in Dolby Digital 5.1 format, along with a French 2.0 track and the original Dolby 2.0 English theatrical soundtrack. The impressive sound design (created at Skywalker Sound) makes full use of the front soundstage, with active panning and solid imaging, though the surrounds are called into use only for music and the occasional sound effect. The airy Hans Zimmer/Trevor Horn score is nicely augmented by alternative pop selections by such artists as Tori Amos, Enya and Thomas Dolby, and the use of music throughout the film accounts for much of its charm. The 5.1 track respects the character of the original mix and is considerably cleaner than the 2.0 track, which is not bad at all but sounds "flat" and slightly muddy in comparison. The French 2.0 track is similar to its English counterpart, though two songs performed by characters within the movie are not dubbed, and there are no French subtitles to make up the difference. A comprehensive collection of advertising materials includes four theatrical trailers and two television spots. They all follow one of two basic formats�one approach abuses clips from the film (and some trailer-only footage) in an attempt to sell it as holiday fun for the whole family. 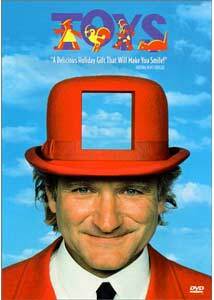 The other style puts Robin Williams in the middle of a field, allowing him to improvise in amusing fashion on the general theme of Toys without giving anyone a genuine reason to see the movie. The trailers are presented here in 1.33:1 format with 2.0 monaural audio, drawn from interlaced video sources. Anyone looking for a root cause of the movie's box-office failure should start right here. An 8-and-a-half minute promotional featurette, consisting of brief interview clips, footage from the film and bits of Williams' trademark improvisations. The promo seems unsure of itself, devoting considerable time to the "hard to describe" nature of the movie without really saying anything, and it plays as an extended trailer more than anything, adding little value to the disc. A collection of trailers for movies only marginally related to Toys, all of them Chris Columbus and John Hughes productions, most with Christmas-related themes: Mrs. Doubtfire (also starring Robin Williams), Home Alone, Jingle All The Way, and Miracle on 34th Street (the completely unnecessary 1994 remake). Here again, the trailers are presented in 1.33:1 full-frame, 2.0 mono format, from interlaced videotape sources. Barry Levinson's 1992 box office failure Toys is an ambitious, visually inventive comedy that ultimately loses its way but still makes for interesting viewing. Fox's DVD features a solid transfer, particularly in the audio department, though the supplements add little to the package. Worth a spin.